School Committee members rated School Superintendent Tommy Chang as proficient in most categories on his yearly evaluation, but said he needed to improve his community engagement. 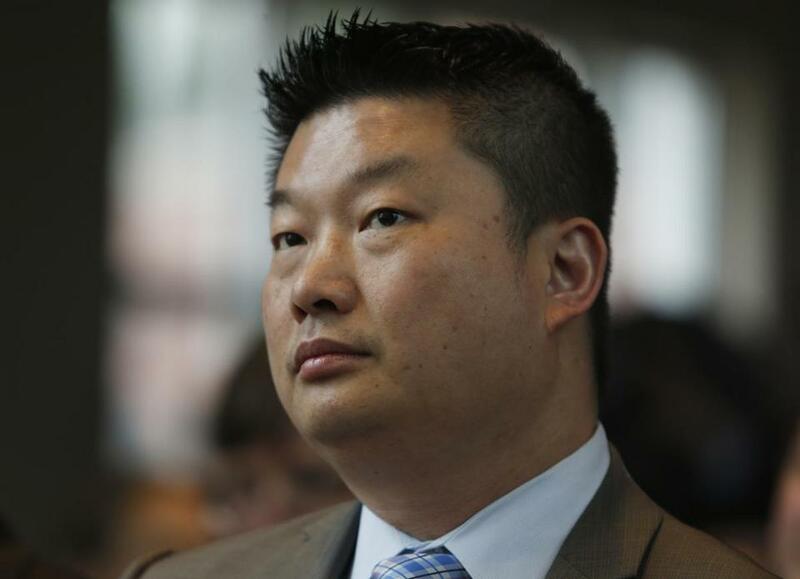 The Boston School Committee Wednesday rated Superintendent Tommy Chang’s performance as mostly proficient for his second year on the job, except for the area of family and community engagement, in which he needs more improvement. The School Committee also gave Chang a “moderate” rating on impact on student achievement, which is the midlevel rating, according to a copy of his evaluation that was made public immediately before the School Committee met Wednesday night. This is the second year that the School Committee highlighted community engagement as a concern, while Chang has for the last two years largely received proficient ratings in instructional leadership, management and operations, and fostering a professional culture. Proficient is the second highest of four scoring categories on the evaluation, while needs improvement is just below proficient. Chang rated himself as proficient in instructional leadership, management and operations, and family and community engagement, and exemplary in setting a professional culture. The evaluation was not totally clear on why the School Committee gave Chang low marks for family and community engagement, but several committee members mentioned that he could have done a better job of communicating to parents about his decision last fall to close the Mattahunt Elementary School in Mattapan. Many parents last fall said they would have preferred working with the school system on improving the school instead of shutting it down, and were caught off guard by the decision. “I encourage Dr. Chang to continue to work towards creating a structure that ensures the involvement of our students and families and community members in the decision-making process to enhance student achievement,” wrote Alexandra Oliver-Davila, who also praised his work on diversity issues. During the meeting, Oliver-Davila said she was proud that Chang was the system’s superintendent. After receiving his evaluation, Chang said during the meeting he was honored to serve as superintendent. The School Committee highlighted several bright spots, such as Chang’s effort to provide more students with rigorous course work in the upper elementary school grades and bringing in more fresh food into schools. The School Committee delivered the evaluation on a night when many parents and students turned out to voice frustration about late school buses and for putting a popular headmaster of an alternative high school on leave. Ashley Leah Mahanama, a parent at the Eliot K-8 School in the North End, said her child’s bus has frequently been arriving late, including one day when it showed up 45 minutes tardy, which caused a neighborhood kid to have a meltdown. Buses also arrive late in the afternoon. The school system this year partnered with MIT researchers to help increase the efficiencies of its bus routes. But the buses are running slightly later than they did last year, John Hanlon, the school system’s chief of operations, told the School Committee. The buses are arriving to school on schedule 82 to 84 percent of the time this year, as compared to 85 to 86 percent of the time last year, he said. He said they may start some routes 10 or 15 minutes earlier and that some buses were leaving the bus yards late because of a shortage of bus monitors.